In this third installment in the “Twisted Lit” series, the authors pay due to Shakespeare’s best-known play, Romeo and Juliet, by modernizing it and setting it in 20th century Chicago. 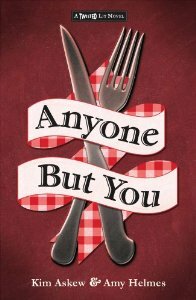 Anyone But You follows two love stories separated by decades of history: in 1933, young Nick Monte struggles to thrive despite anti-Italian sentiment, while 80 years later, Gigi Caputo, daughter of impoverished restaurateurs, is forced to decide between familial duty (obeying her parents by dating the son of a snobby venture capitalist), or following her own heart (which is telling her to pursue her crush, Roman Monte). By entwining two stories of prejudice, thwarted love, and family, the novel succeeds by virtue of honoring the spirit of the original story rather than the letter, allowing the authors to explore modern, relevant ideas while still keeping the story fresh. Recommended for readers ages 14-Up.